I don't know about everywhere else, but in Iowa lately it is 80° one day, then down into the 50's the next! Finally this past week it is staying a bit warmer and my daycare kiddos and I have been spending more time outside. With Mother's Day coming up this weekend, I wanted to have them each make something to take home to their mom's. I thought about paintings, hand prints, etc. But while looking at my blooming flower garden, I thought about having them give flowers to their mamas! So for an inexpensive craft day to tie into it, I bought plastic planters at Walmart for 96 cents each, some potting soil, and a flat with a variety of plants. I bought 6 of the 6 flower packs in all different flowers so the kids could pick which one they wanted to give to their mom. 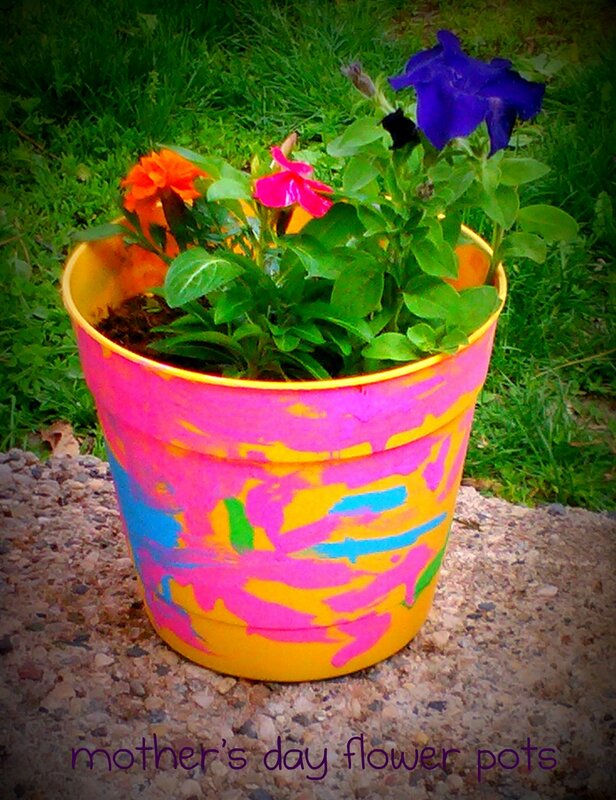 Using some acrylic paint (and painting aprons) I let the kids go crazy and paint the pot. I chose plastic pots, as the ceramic ones absorb moisture and would make the paint wash away quickly. 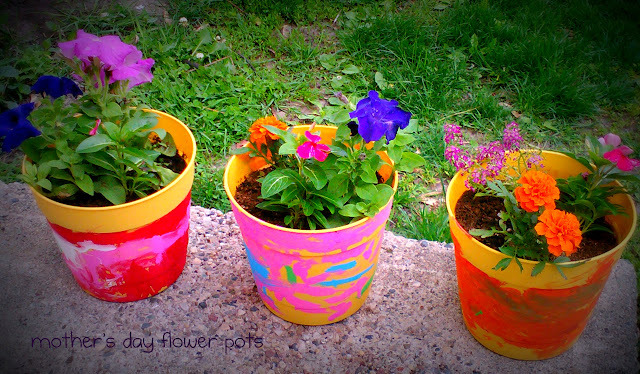 After they were painted, and dried for a day, I poured in some potting soil and let the kids pick their flowers. It was extra fun getting out the watering cans and letting them water the flowers afterwords. Some may have flooded a wee bit, but all-in-all I'll have some happy mamas come Friday when they go home! Not are all done yet, but above is a photo of a few of them, and below is the one my daughter made for me, that she knew I "would just love it" and she is right. I do love it!